These joyfully colourful chewy sweets are brought to you by Rowntree's®, the makers of the classic Fruit Pastille. The story begins in 1862, when Henry Rowntree bought a cocoa works in York and transformed it into a confectionary company. Fruit Pastilles were invented in 1881, and since then we've been inventing even more delicious ways to enjoy fruity-flavoured sweets, such as Jelly Tots®. 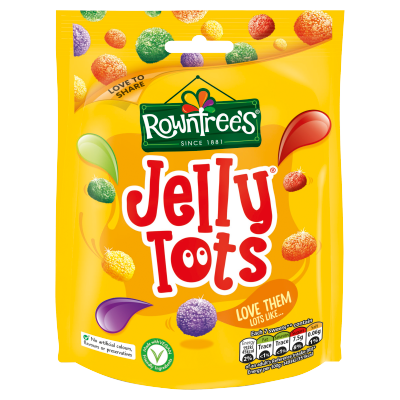 Following on from this, the confectionery company developed ROWNTREE'S Fruit Gums, JELLY TOTS and TOOTY FROOTIES. 2009 saw the launch of the newest edition to the family - ROWNTREE'S RANDOMS. All sweets in the Rowntree's® family are a great way to enjoy a more colourful, fruity-flavoured treat time. 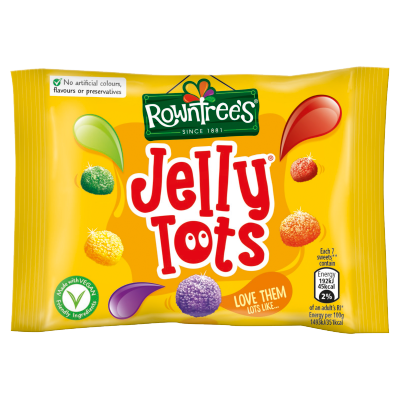 Rowntrees JELLY TOTS 150g is rated 4.7 out of 5 by 393. Rated 1 out of 5 by MarkR from Changed Recipe and Size I think Jelly Tots just grew up! I got one of the 130g tubes for Christmas and looked forward to eating them - I would rate them my favorite jelly sweet. Not any longer. Not only are they twice the size, but they do no have the taste I remember and are a harder jelly. They remind me of the jellies in Dolly Mixtures now. Sorry, but Fruit Pastilles are my new favorite. Rated 1 out of 5 by Tiff from The Change! I have just bought a bag of jelly tots after craving them for a while! I open the bag, I put one in my mouth - don't bother checking the colour I like them all - and BAM, I am hit with pure disappointment. I take one out the bag and I notice - this jelly tot is fat and tall! This is not a usual jelly tot. I inspect the packaging to see if I picked up a copy cat brand that didn't quite hit the mark but to my shock, they were Rowntrees... and they've changed. And changed for the worse they have. I am so sad those small, flat discs that were a little bit harder to chew have become a miniature fruit pastille. Please - return the old tots!! Rated 2 out of 5 by Marina from Odd shaped JT Christmas is a wonderful time coz that’s when you get barrel jelly tots so I bought 6, these are from my childhood days and I still love them BUT why has the shape changed - they taste the same but don’t look anything like the traditional jelly tots and also reading comments they are NOT suitable for vegetarians or vegans ROWNTREE YOU HAVE RUINED CHRISTMAS BECAUSE I SHALL BE RETURNING ALL 6 SHAME ON YOU!! Rated 1 out of 5 by Gnashinghamster from Why change the shape of them? Used to love Jelly Tots, they were tiny and squishy now they are big hard lumps. Why mess with perfection??? Rated 5 out of 5 by Grumpyswife from Colourfully fruityness I've been buying Jelly tots on and off for years for the children and grandchildren, sometimes sneaking a few. Today I indulged myself with a big bag and no sharing! Delicious, fruity flavours all just as good, no mediocrity here! Indulge I say and enjoy! Rated 3 out of 5 by Stateside from Get rid of Green! I have loved Jelly Tots for ever. But they definitely used to be better. The green ones are awful, I usually take the time to throw them in the bin as soon as I open a bag. Also, please make a bag of just purple and pink like you did with the Pastilles. Rated 1 out of 5 by ONC147 from Not Vegan or Vegetarian Anymore Jelly tots are no longer vegetarian according to the latest vegetarian list on Nestlé's website as well as an email exchange between myself and them to check this wasn't an omission. However they still say suitable for vegetarians on this site, and I have as yet not heard why they have changed. Rated 4 out of 5 by Malcolm from Whats up with the green ones? Writing in from Canada, just discovered these, and love the texture and all the flavours except the green ones. What's up with them, they taste like soap and ruin any other flavours they're paired with. Should change them to an apple flavour or something. Rated 5 out of 5 by Karianne from Awesome VEGAN candy!!! I love these so so so much! But PLEASE can you make ones with just red jelly tots! Rated 5 out of 5 by Willowk from Love love love!!! Love that I'm able to eat these; there are very few sweets of this type out there that are suitable for vegetarians.....wish there were more! Rated 5 out of 5 by Littlemiss from Wish I was seeing Red! Love these sweets but can you bring out a reds only tube please. Always feel a little shortchanged as these are my favourites and there always so many more yellows and greens!! Rated 5 out of 5 by Anonymous from Jelly tots of the pops!!!! Im fat and I love them! Lovely Sweets!!!!!!!! Yum! Rated 5 out of 5 by Anonymous from Brilliant for Football Games I always bring a bag or two of Jelly Tots when I go to play a football game. number one sweets for football !! Rated 1 out of 5 by Refereesmum from Stale Christmas tube of jelly tots with a best before date of March 2017. Stale and inedible. Rated 1 out of 5 by Jack from SUGAR I bought this team the other day and god half a tube full of sugar ..... i was outraged I emptied the contents of the sugar into a bowl and this is how much came out .! would like to talk to a member of staff about this and also a refund !